Basic maths skills are one of the most important things you can share with your children while their brains are so sponge like and they haven't been given the idea that they can't do maths. Simple things like counting when you go up steps, hunting for shapes in pictures and using maths language - 'here, you can have two quarters of this sandwich, that makes a half a sandwich' all build up the ideas without ever sitting down and getting out the books. If you're looking for a way to take your maths into the garden or park, this idea might be for you. We call it 'garden stew' and it's a way of encouraging counting, shape and colour recognition as well as a little botany on the side. You can use any props you have to hand, such as plastic plates or an old plastic plant pot, but if you have nothing at all it still works. Holding an imaginary recipe card, send your little ones off to hunt for ingredients for garden stew. For example, show them a dandelion flower and send them off to collect four dandelions and bring them back. 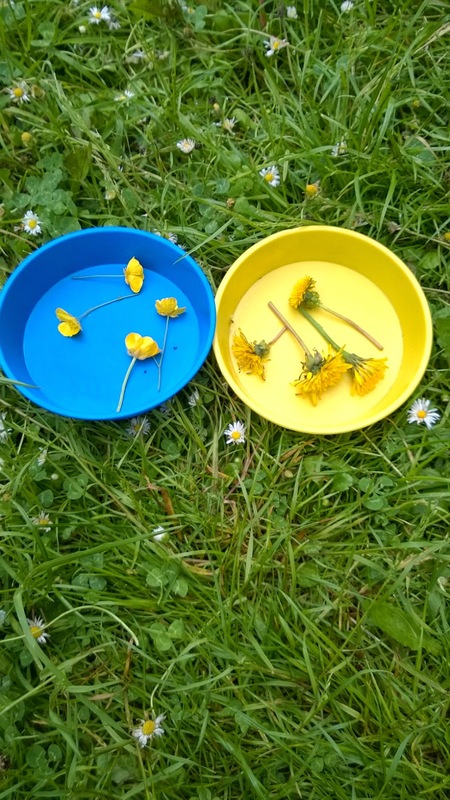 If they bring a different flower say 'hey, that's a really pretty buttercup and it's the same colour as a dandelion but right now we're hunting for dandelions, lets save this for later and look for these ones now' then show them the one you want again and help them hunt for it. If they bring too few, say 'brilliant, that's three, we need one more to make four' and send them off again. If they bring too many 'wow that's six, we need to take two away to make four for our recipe'. Avoid saying 'no that's wrong, you need four' because the point of this is to have fun and build their confidence with numbers and the words you use have an incredible effect on children, either building them up or knocking them down depending on how you phrase things. Continue with whatever flowers and leaves you wish - obviously common, non-poisonous plants that are close by. You could also do this with pebbles, sticks, or whatever safe items you have to hand. Once you have all the 'ingredients' tip them into a pile, give it a stir, sit down and pretend to eat your yummy garden stew. Once again you can use your fractions words - 'help me to give a third to your brother, a third for you and a third for me'. It's our job to build their maths confidence high enough now that they carry that through their lives.